The newly launched 2018 Hyundai i20 CVT automatic is competitively priced and competes in an established segment. Here are five things you need to know about the all-new offering. It's been three months since the 2018 Hyundai i20 facelift hit the market, and now the Korean automaker has officially launched the new petrol automatic variant as well of its popular selling hatchback. Hyundai India promises better performance, convenience and smoother gear shifts with the 2018 i20 CVT and the model is priced quite competitively too, starting from ₹ 7.04 lakh for the Magna version, going up to ₹ 8.16 lakh (all prices, ex-showroom) for the Asta trim. At this price point, the new i20 CVT undercuts its rivals in pricing while also being loaded with features. With bookings open, here are five facts you need to know about the new Hyundai i20 CVT Automatic. 1. The 2018 Hyundai i20 CVT is a major upgrade for the hatchback, which brings the continuously variable transmission (CVT) for the first time to the model. The new CVT unit is paired with the 1.2-litre petrol engine that produces 83 bhp and 115 Nm of peak torque and replaces the ageing 4-speed torque converter that was offered with the 1.4-litre petrol engine. 2. 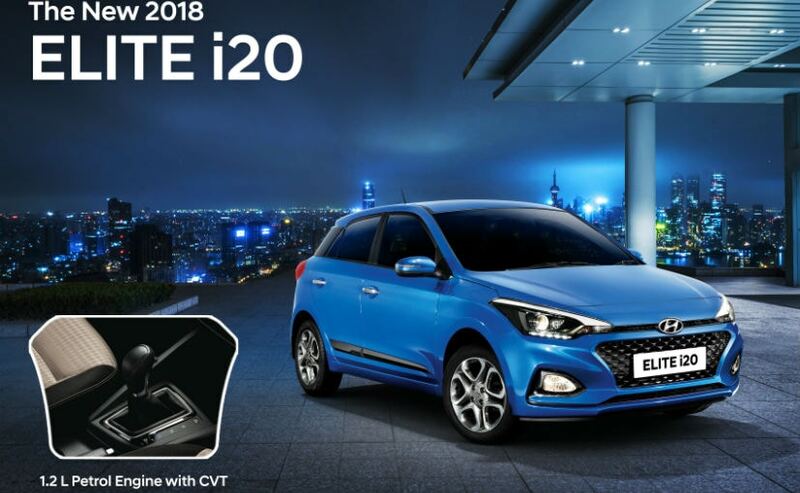 With Hyundai now using the same 1.2-litre petrol motor with the CVT, the 2018 i20 petrol automatic complies with the sub 4-metre vehicle taxation norms, which restricts the petrol engine displacement to 1200 cc. As a result, the new model is significantly cheaper than its predecessor. Compared to its manual counterparts, the new i20 automatic is priced at a premium of around ₹ 1 lakh. 3. The 2018 Hyundai i20 CVT automatic is offered in the mid and top-level trims, and the come loaded with most bells and whistles. The car gets projector headlamps, LED DRLs, cornering lights, new 16-inch diamond cut alloy wheels, as well as a dual-tone exterior paint job. Hyundai also offers red and orange interior colour pack to spruce up the black and grey cabin. 4. Inside, the cabin comes with a multi-function steering wheel, automatic climate control, while the mainstay is the new 7-inch touchscreen infotainment system. The unit offers access to smartphone connectivity, Apple CarPlay, Android Auto and MirrorLink. You also get the DRM Arkamys Sound Mood and Navigation tech. For added comfort, the i20 comes with rear AC vents and centre armrest with cupholders. The i20 automatic gets dual airbags with ABS and EBD as standard, along with ISOFIX, reverse parking camera and speed sensing door lock. 5. Compared to the Maruti Suzuki Baleno's Delta trim, the 2018 Hyundai i20 CVT Magna undercuts its rival by ₹ 5000. However, the difference is massive when compared to the Honda Jazz CVT S trim, which is ₹ 66,000 more expensive than the i20 automatic. Similarly, the top-spec Baleno AT Alpha is pricier by ₹ 24,000 over the i20 Auto Asta, whereas the Jazz CVT is more expensive by ₹ 30,000 over the top-spec Hyundai.